Summary Realtek-based 2.4 GHz 11bgn Gigabit router with high transmit power and very high wired and wireless throughput. 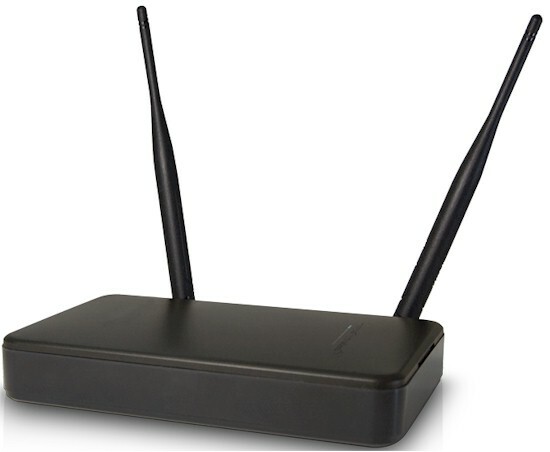 The Amped Wireless R10000G High Power Wireless-N 600mW Gigabit Router is the current top of Amped's line of 2.4 GHz 802.11bgn routers. It features a 620 MHz Realtek processor, dual 600mW amplifiers and four-port Gigabit switch. Amped's marketing materials claim up to 10,000 sq. ft. of coverage, which the company backs with a guarantee of 35% off your next router if it fails to meet that promise. The rear of the router has the antenna connectors, a reset switch, WPS button, a power connector, 4 Gigabit LAN ports, and a Gigabit WAN port. The front panel has indicator lights to indicate a connection to ports in the rear. One nice feature is that it illuminates a number on the front panel to correspond with the port on the rear. Unfortunately, there is no indication as to whether the device has connected at Gigabit speed, which would have been nice. The router has rubber feet to sit horizontally, but also includes a stand to sit upright as shown in Figure 2. However, I found that the stand did not fit very tightly around the router and the router would often rock backwards on the stand with cables connected. The upright stand also seemed to be an uncomfortable setup when the 5 dBi antennas were connected, but it's there as an option should you not wish to have the router horizontal. To speed the review along, Tim ran the tests on an R10000G, but sent me a feature-equivalent R10000 to write the feature review. So don't be alarmed when you see "R10000" in some of the screenshots and photos. The heart of the R10000G is a Realtek RTL8198 SoC, which includes a 32 bit RISC CPU and five port Gigabit switch that supports the four LAN and one WAN ports. A Realtek RTL8192CE 802.11b/g/n 2T2R WLAN SoC and two SiGe SE2576L 2.4 GHz High Power Wireless LAN Power Amplifiers make up the radio. 64 MB of RAM and 4 MB of flash complete the router. For reference, the R10000 uses a Realtek RTL8196C, which is the 10/100 version of the 8198. It also has 32 MB of RAM vs. the R10000G's 64 MB. The R10000G has a nice set of features in an admin interface that is nicely laid out and user-friendly. Here is a list of features R10000G that I complied from its datasheet and admin UI. • Virtual Server entry for single or multiple ports with TCP, UDP or all protocols forwarded. Enable/disable for each entry. • Port filtering – can set individual or range of incoming ports. Allows you to enable or disable TCP and UDP ports on network devices. • Enable/disable bandwidth control with user settable egress/ingress (upload/download) speeds.